On October 3, 1909, when the Cincinnati Reds took the first game of a doubleheader from St. Louis, they were assured of both a winning season (their first since 1905) and a first-division finish (their first since 1904). Manager Clark Griffith celebrated by giving his regulars the rest of the day off. Griffith had been looking for an opportunity to conduct a little experiment and now, with no more goals to shoot for and only one more playing date on the schedule, he did it. For the second game of the doubleheader, he drew up a lineup composed almost entirely of rookies. Of the eight position players, four were in their first season of professional baseball. Two were making their major league debuts. Four others had been in the majors less than a month; two of them were still seeking their first major-league hit. The “veteran” of the group was second baseman Ray "Chappy"Charles, a second-year man recently acquired in a trade. Aside from Charles, the entire group had logged barely a dozen games in the big leagues. Roy “Slippery” Ellam, 23, shortstop. Purchased from Birmingham; apparently regarded as a defensive wizard, he got a look despite hitting just .196 in 141 games in the Southern Association. Wheeler “Doc” Johnston, 22, first base. Purchased for $1,5006 from Chattanooga, where his .323 average helped the Lookouts win the South Atlantic League championship.7 Major league debut. Mike Konnick, 20, catcher. Obtained in exchange for minor leaguer Frank Egan and $2,0008 from Wilkes-Barre, where Konnick hit .286 to help the Barons to the pennant. “The catching find of the season” in the New York State League.9 Major league debut. Arthur “Swat” McCabe, 27, center field. Purchased from New Britain in the Connecticut State League, where he won the batting title with a .366 average. The Cincinnati fans didn’t have much to cheer about after that. According to The Sporting News correspondent Charlie Zuber, the rookies muffed fly balls, made wild throws and “allowed base hits to scoot past them without so much as saying ‘howdy.’”15 The Cardinals took the lead in the second inning on Al Shaw’s two-run single and added four more runs in the third, three of them when McCabe dropped a routine fly with the bases loaded, then threw the ball over Dolan’s head. The Reds managed six hits off right-hander Eddie Higgins, including three straight singles by McCabe, and got on the scoreboard in the fifth when Dolan walked, went to second on a passed ball and came home on Konnick’s double. St. Louis piled up 11 hits, stole five bases (attributable in part to some “off color” throws by Konnick16) and took advantage of an equal number of errors. When the game was mercifully halted because of darkness after only six innings, the Cardinals had an easy 8-1 victory. 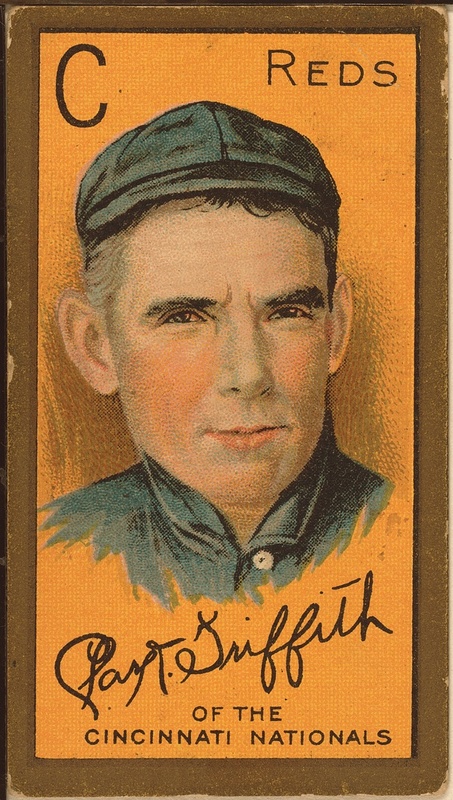 1 A sense of how many prospects Griffith had milling around at the end of the 1909 season can be gained from a story a week earlier, when he first broached the possibility of entrusting a game entirely to youngsters. At that time, he proposed a considerably different lineup with Ward Miller in right, Ezra Midkiff at second, Si Pauxtis catching, and either Chet Carmichael or Jean Dubuc pitching. See “Nine Red Regulars Will Lose Jobs Temporarily if Bob Spade Wrests Victory from Superbas,” Cincinnati Post, September 28, 1909. 2 In 1909 there were 34 minor leagues classified (from the top down) AA, A, B, C and D. See Lloyd Johnson and Miles Wolff, eds., The Encyclopedia of Minor League Baseball (Durham, N.C.: Baseball America Inc., 1993), 120-21. For this game, the Reds drew on one Class D league (Wisconsin-Illinois), three Class C leagues (Ohio-Pennsylvania, South Atlantic and Western Association), two Class B leagues (Connecticut State and New York State) and one Class A league (Southern Association). None of the rookies had yet reached Class AA. 3 Not to be confused with outfielder Patrick Henry “Harry” Dolan, also known as “Cozy,” who played in the major leagues between 1895 and 1906. Besides the coincidence of their names, the younger Dolan was tagged with the same nickname because some believed he bore a physical resemblance to the original. See James K. Skipper Jr., Baseball Nicknames: A Dictionary of Meanings and Origins (Jefferson, N.C.: McFarland & Co. Inc., 1992), 71. 5 Minor league averages from Baseball-Reference.com. 6 “South Atlantic League,” Sporting Life, August 28, 1909, 23. 7 The Chattanooga player listed on Baseball-Reference.com as Wheeler Rogers Johnson is clearly the same player listed elsewhere on the site as Wheeler Roger “Doc” Johnston. See references to Wheeler Johnston with Chattanooga in “South Atlantic League,” Sporting Life, May 29, 1909, 24 and again August 28, 1909, 23. See also Johnson and Wolff, 120; and Marshall D. Wright, The South Atlantic League, 1904-63: A Year-by-Year Statistical History (Jefferson, N.C.: McFarland & Co. Inc., 2009), 30. Though Baseball-Reference.com shows no minor league record for Wheeler Roger “Doc” Johnston in 1909, it does list a transaction with Chattanooga selling him to Cincinnati on August 16 of that year. 9 “National League Notes,” Sporting Life, July 31, 1909, 17. 10 “National League Notes,” July 10, 1909, 9. 11 “National League Notes,” September 18, 1909, 24. 12 “Griff would liked to have used [Bob] Ewing in the box ... but he knew that thousands of the fans had come to see him pitch.” See “Best Phillies Can Do Now is Tie Clark Griffith’s Redlegs,” Cincinnati Post, October 4, 1909, 6. The same point was made in Jack Ryder, “Griff and the Kids Lost Out,” Cincinnati Enquirer, October 4, 1909, 4. 13 Sporting Life listed the attendance as just 5,000 but three Cincinnati newspapers – the Post, the Enquirer and the Commercial Tribune – reported it at 10,000 or more. 14 Jack Ryder, “Griff and the Kids Lost Out,” Cincinnati Enquirer, October 4, 1909, 4. 15 C.H. Zuber, “Griff Made Good,” The Sporting News, October 7, 1909, 4. 17 “Cozy Dolan,” The Sporting News, October 17, 1958, 22. 18 Defense may have been McCabe’s downfall. He hit .326 in 16 major league games, but in 12 games in the outfield he was charged with three errors and compiled a fielding average of just .875. He batted .287 over 10 years in the minor leagues, retiring in 1916 at age 34. See “Swat McCabe,” Baseball-Reference.com. 19 The father was Delmer John Young. The son was Delmer Edward Young. 20 “Obituaries,” The Sporting News, July 24, 1971, 45. 21 See Harry A. Williams, “Among Baseball Men,” Los Angeles Times, January 20, 1913, III3; and “Claire [sic] Patterson Dead at Mojave,” Los Angeles Times, March 29, 1913, III4. 22 Frederick G. Lieb, “Griffith Canny as Hill Star, Pilot, Owner,” The Sporting News, November 2, 1955, 11-12, 14.